When the National Democratic Congress (NDC) leaders organised and went on a demonstration last Thursday, no eyes were plucked. Indeed it was a demonstration with a difference. It was unlike what happens when such protests are undertaken under an NDC dispensation. A New Patriotic Party (NPP) supporter joined a demonstration at the height of the NDC’s bad governance and lost an eye: a pro-NDC superior officer in charge of Operations at the time targeted him for the harm and showed no regret. During the demonstration under review, we saw a law enforcement detachment offering full protection to the marchers in a manner which many found refreshingly different. It is easy to imagine how the NDC would have managed such a demo. Of course, appallingly! The man who lost his eye and attracted headlines soon after the incident, suffered a psychological pain from an NDC apparatchik, Dr. Omane Boamah then Communications Minister. He added salt to the injury sustained by the Justice Adjakuma by stating ignorantly that he had applied tomato puree on the eye. The blood oozing from the damaged eye, according to him, was therefore not what was being presented. The demonstration was ostensibly in reaction to the Ayawaso West Wuogon constituency violence occasioned by an exchange of gunfire. 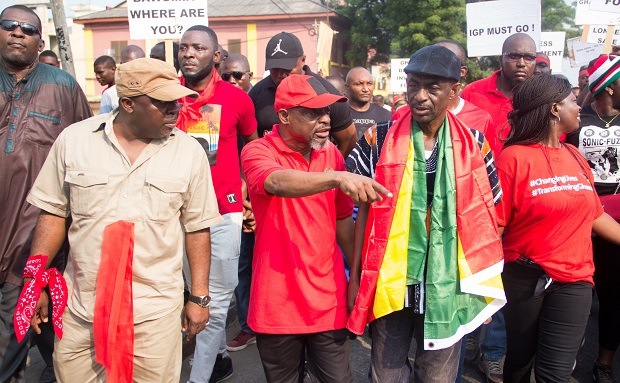 An interesting development following what some described as a health walk by mostly obese persons from the NDC leadership was the disowning of Bernard Mornah by the leadership of the People’s National Convention (PNC). The semblance of a multi-party touch Bernard and indeed his NDC cohorts sought to present to the people of Ghana as being the picture of the demonstrators, has by the development escaped through the window, an exposed lie. We had indeed indicated in our story about the demonstration that it was an NDC affair nowhere near a multi-party protest. In any case, how many parties exist in the country going by the laid-down criteria in the Political Parties Laws? The register of political parties would have to be reviewed: groupings which do not meet the standard requirement as set out by the Political Laws of the land must be delisted. Clowns on the political space are making too much noise even when they do not meet the minimum requirements for political parties. So-called political parties which emerge from hibernation when there is a demonstration or even when there is a debate over whether or not to review the voters’ register, should be delisted. The organizers of the demonstration claim they were spurred into action because of, what in their warped opinion, was a heightened insecurity in the country. A country where citizens can go on demonstration and not lose an eye or a limb is secure and not otherwise. Demonstrators do not suffer encumbrances such as being told they cannot exercise the right because there is insufficient number of police personnel. Politicians on the other side of the aisle should stop throwing dust into the eyes of their compatriots because the pastime is offensive.